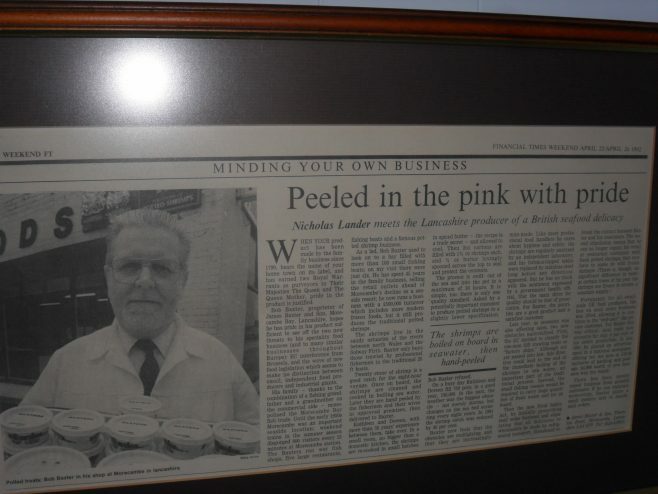 Photo of framed newspaper article dated 25/04/1992 entitled Peeled in the pink with pride  Nicholas Lander meets the Lancashire producer of a British seafood delicacy and including a photograph of Bob Baxter stood outside the shop and holding a tray of potted shrimps. A citation enrolling Samuel Baxter as Member of the British Empire, issued by the Court of St. James, London. A glass fishing float seen at the house of Hilda Burrow, one of the oral history interviewees. A Morecambe Bay fishing boat on her side. A netting needle or shuttle and a glass fishing float seen at the house of Hilda Burrow, one of the oral history interviewees. A netting needle or shuttle loaded with twine seen at the house of Ernie Nicholson, one of the oral history interviewees. A netting needle or shuttle seen at the house of Hilda Burrow, one of the oral history interviewees. An unkown fisherman at a landing stage. Bill Bisset, warehouseman at the Fishermen's Co-operative with his carnival entry. Close up of different types of fishing nets seen at the house of Ernie Nicholson, one of the oral history interviewees. Close-up photo of trailer loaded with fishing nets and rope at Flookburgh Bay. Ernie Nicholson holding up a glass fishing float in netting. Fishermen from Morecambe and Fleetwood attending a week's course on fish biology and navigation 1. Fishermen from Morecambe and Fleetwood attending a week's course on fish biology and navigation 2. Fishing boat "Jane" on moorings off Green Street, Morecambe. Fishing boats sailing in Morecambe Bay. Flookburgh fisherman, Harold Manning, preparing to lower his shank net into the water to catch shrimps 1. Flookburgh fisherman, Harold Manning, preparing to lower his shank net into the water to catch shrimps 2. Haaf netting behind Victoria Inn, Glasson Dock. Have you heard the cockles sing? John Baxter aboard his fishing boat, LR 22, named Connie Baxter,sorting through a catch during a fishing trip in Morecambe Bay. John Baxter working on his fishing boar LR 22, names Connie Baxter, looking forward. John Baxter working on his fishing boat at a jetty off Morecambe. Model of a trawl net 1. Model of a trawl net 2. Morecambe Fishermen's Cooperative Society entry in the local carnival 1. Morecambe Fishermen's Cooperative Society entry in the local carnival 2. Mussel boats sailing in the Morecambe Regatta 1. Mussel boats sailing in the Morecambe Regatta 2. Musselers landing their catch at Kilnbrow cart road. Musseling on the Knott End Skeer off Heysham 1. Musseling on the Knott End Skeer off Heysham 2. Oral history interview with Ellen Shuttleworth, member of the Burrow fishing family in Grange area and around Sunderland Point. Oral history interview with Elsie Patton and Joan Rowlandson on Flookburgh way of life and family arrangements. Oral history interview with Jim Unsworth. Grew up in Morecambe and has vivid memories of what the fishing industry used to look like. Oral history interview with Sydney [Sid] Eastwood. Memories of fishing industry from Fleetwood side. Photo of Baxter's fish shop interior showing the cash till, the serving counter, a chalk board listing items for sale and various photos on the wall. Photo of James Baxter & Son fish shop front in Morecambe. Photo of newspaper article entitled Pots of pleasure by post. Photo of shop front sign at Baxter's fish shop giving details of opening hours and indicating that they are specialists in supplying Morecambe Bay potted shrimps. Photo of trailer loaded with fishing nets and rope at Flookburgh Bay, seen from different angle. Photo of trailer loaded with fishing nets and rope at Flookburgh Bay. Photo of two trailers loaded with fishing nets at Flookburgh Bay, with sea in the background. Photograph of Barbara Dawe and Jean Dennis, interviewees for oral history project. Photograph of Charlie Overett, interviewee for oral history project. Photograph of Dorothy Calverley, interviewee for oral history project. Photograph of Ernie Nicholson, interviewee for oral history project. Photograph of Jack Manning, interviewee for oral history project, with photograph on wall behind him of a fisherman stood on the back of a horse and cart on the sands (version 2). Photograph of Jack Manning, interviewee for oral history project, with photograph on wall behind him of a fisherman stood on the back of a horse and cart on the sands. Photograph of Keith Willacy, interviewee for oral history project. Photograph of Marc Overett, interviewee for oral history project. Photograph of Peter Gaukroger, interviewee for oral history project. Photograph of Ted Hartley, interviewee for oral history project. Plover Scar lighthouse seen from Sunderland Point at dusk. Relaying mussels in the Ring Hole, Morecambe 1. Royal Shrimps on a Toasted Muffin anyone? Samuel Baxter (Right) on the stone Jetty, Morecambe attending to fishing gear with LR 151 in the backgrouns. The emblem of the L & W.S.F.J.C. The Lune estuary at Sunderland Point showing five small boats. View across the River Lune from Sunderland Point across to Glasson Dock, with a pleasure yacht and a local fishing boat in the foreground and the Bowland Fells in the background. View across the River Lune from Sunderland Point across to Glasson Dock, with the yachts in the marina just visible in the distance and two small boats in the foreground. View from Sunderland Point showing four local fishing boats at low tide on grassy bank and electricity pylons in distance. View of fishing baulks and channels at Flookburgh Bay. View of fishing baulks at Flookburgh Bay looking inland. View of Lune estuary at Sunderland Point at low tide showing 6 small boats. View of sea with the tide in and seven small boats from the promenade at Morecambe. View of the breakwater and sea with the tide in and five small boats from the promenade at Morecambe. View of the sea with the tide in and a small fishing boat in the foreground from the promenade at Morecambe. View of the sea with the tide in and five small boats from the promenade at Morecambe. View of the sea with the tide in, three small fishing boats and four other boats from the promenade at Morecambe.